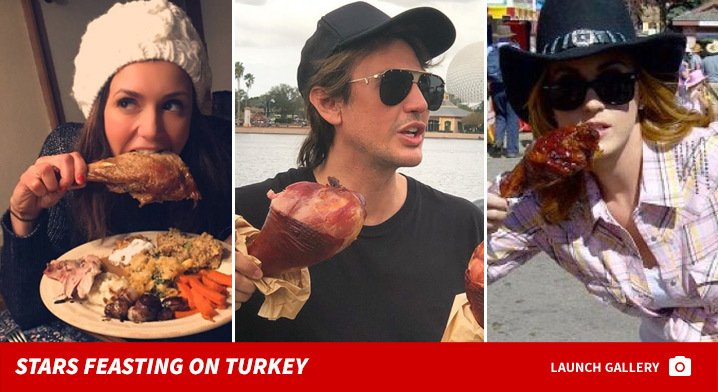 Anthony Weiner and El Chapo won’t have to wait long to lick their chops for Thanksgiving … the prison meal’s served at lunch time. We did a little digging and found out Weiner and Chapo — serving time at Federal Medical Center and Metropolitan Correctional Center — will stuff their faces with turkey, gravy and mashed potatoes. For dessert, Weiner gets pie and Chapo gets candied sweet potatoes. When it comes to dinner, all they get is an assorted box that includes sandwiches. — Real turkey, stuffing, mashed potatoes, gravy, green beans, cranberry sauce, rolls and pumpkin pie. — 6 oz turkey, mashed potatoes, peas and carrots, stuffing, gravy, and vanilla sundae. — Turkey, ham, green salad with Italian dressing, stuffing or yams and cheesecake. To wash it down … tea, Kool-Aid or water. — Roast turkey, gravy, cranberry sauce, candied yams, steamed veggies and carrot cake. There’s also a kosher menu and modified meals to accommodate therapeutic diets.